Abstract: Environmental cost-benefit analysis compares an assessment the benefit of the abatement or containment of a particular form of environmental damage with the cost of the measures needed to attain that abatement or containment. It is in that context, as with other applications of cost-benefit analysis, usual to apply a discount rate. A number of relatively recent textbooks in environmental economics suggest that general economic theory provides a clear and well-established benchmark as to what this discount rate should be: some kind of ‘average’ of the market rate of interest. There are questions about that assertion in general. Our focus in this paper relates to a more specific problem: the relative scarcity of environmental resources in comparison to produced goods. A specific framework of analysis is offered in that context. Economic Issues, Volume 9, Part 1. Paper of the Month: What is the EMU Effect on the UK’s Exports to Eurozone Countries? Abstract: This paper investigates the EMU effect on the UK’s exports to eurozone countries, using pooled data from 1981-2006 between the UK and all EU members at the time when the euro was launched. The results show that EMU led to a decrease in the UK’s exports to the countries that adopted the euro as their national currency. That decrease is statistically different from zero. 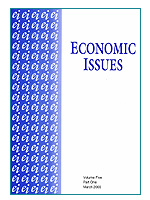 Full text pdf available at: http://www.economicissues.org.uk/Files/110Aristotelous.pdf.